Inside São Paulo: Come for an authentic Italian night at Mooca Mia! Mooca Mia is an event prepared for lovers of Italian culture. It's a thematic dinner show in a characteristic Italian style square. 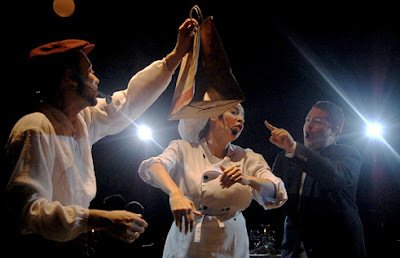 The authentic "Vila Italiana" mood is gathered with old style music and a theatrical presentation based on the "Commedia del'art". Of course that the highlight is the Italian Cuisine containing an antipasto, three options of main dish and two different deserts. All included. Organized on Mooca Suburb, one of the most Italian neighborhoods in town, Mooca Mia offers every Tuesday a special presentation of Italian Culture after a delicious dinner. It's a pretty much touristic night and also a great opportunit to see how strong is the Italian predominance in town. Where: Restaurante Don Carlini — Rua Dona Ana Neri, 265 — Mooca — São Paulo. When: October 6th and further presentations are organized on their agenda, from 8pm till last client. The Dinner starts at 8h30pm and the presentation at 9h15pm. How Much: R$ 120 per person for dinner plus show (beverage is not included).